Do you understand how visitors convert on your blog or website? 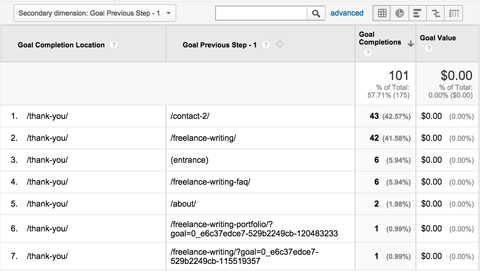 Are you tracking conversion goals? Knowing how visitors convert on your website can help you improve your marketing. In this article I’ll show you how to dive into Google Analytics Conversions reports so you can optimize your site for more conversions. 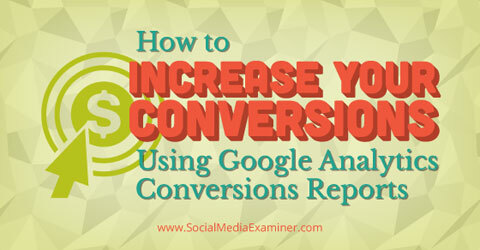 Find out how to use Google Analytics Conversions reports. Google Analytics left sidebar menu with Conversions section. Conversions reports are broken into four sections. While some conversion reporting areas look similar to the standard reports you will find elsewhere in Google Analytics, many are customized to the data they represent. Each data set is based on the reporting period you define in the date range drop-down menu. Ready to learn more about them? Let’s get started with a list of terminology. Goal Completions—The total number of conversions. Goal Value—Total Goal Value is the total value produced by goal conversions on your site. This value is calculated by multiplying the number of goal conversions by the value that you assigned to each goal. Goal Conversion Rate—The sum of all individual goal conversion rates. Total Abandonment Rate—The rate at which goals were abandoned. Defined as Total Abandoned Funnels divided by Total Goal Starts. Assisted Conversions—The number of conversions for which this channel appeared on the conversion path, but was not the final conversion interaction. Assisted Conversion Value—The value of the conversions assisted by this channel. The Goals Overview report gives you a quick summary of the total number of goal completions made on your website. 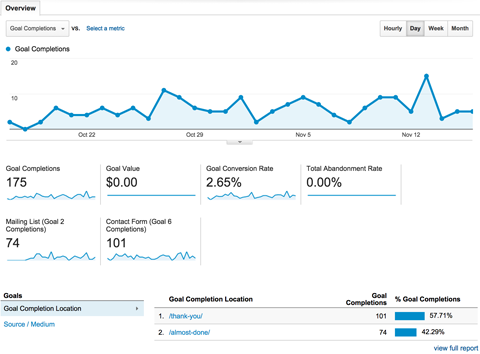 Google Analytics Conversions Goals Overview. You can quickly view the pages where goal completions are made or click the Source/Medium link to see where converting traffic originates. To dig deeper, you can click through the following detailed reports. The Goal URLs report shows the URLs on your website where visitors convert. If you use the Destination goal type, this is the URL visitors land upon once a goal has been completed, such as a thank-you or confirmation page. To find out which pages on your website lead to the most conversions, use the Secondary Dimension drop-down and select Goal Previous Step – 1. The goal URL report will then display the page a visitor was on before landing on the Destination URL. See which pages lead to the most conversions. The Reverse Goal Path report displays up to four steps in the goal completion journey. In the example below, you can see that some people started on the home page (represented by the /), submitted a contact form from the freelance-writing and contact-2 pages and landed on the thank-you page to complete the goal. Find out where converting customers started on your website. This report shows you two things. First, it shows you the most popular pathways people take to complete a goal on your website. Second, it shows how many steps people take to complete a goal. For example, the majority of people who complete a goal only go through three pages at maximum, from entrance to completion. If this is the case, you may want to shorten other pathways through your website to get people to the goal faster. 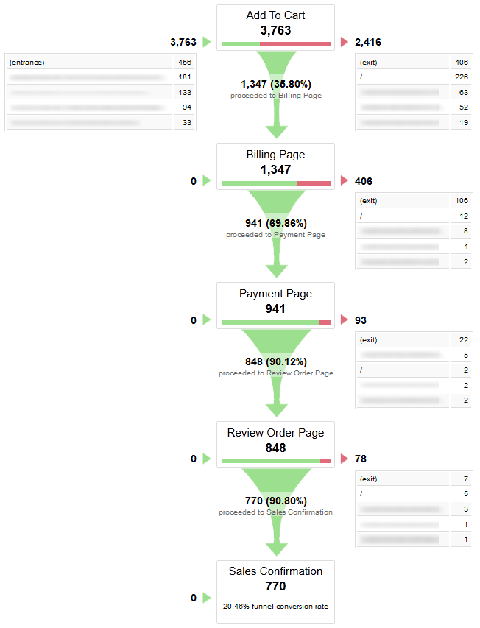 If you set up your Destination goal to track multiple steps in the conversion process, you will be able to see the steps your visitors take in the Funnel Visualization. If you setup a Destination goal with one URL, your funnel will look like this. Google Analytics Conversions Destination goal tracking with a single URL. 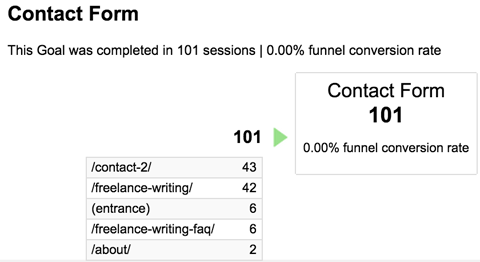 Funnel visualization is critical for those sites with multiple steps in the goal completion process. You can find out where in the conversion process people drop out before making a purchase. If you set up multiple steps, such as those a visitor experiences with a shopping cart, your funnel will look like this. 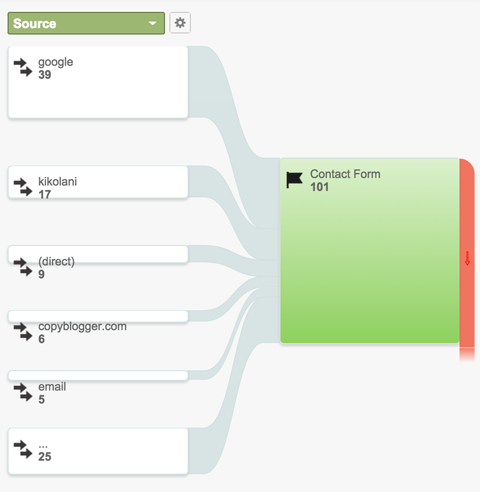 Google Analytics Conversions Destination goal tracking with multiple URLs. In the example above, only 35% of people who add a product to their shopping cart continue on to make a purchase. This means that you should work on optimizing that part of the sales process to increase conversions. The Goal Flow displays the goal completion paths of visitors in a flowchart. You can use the drop-down to show traffic sources and other dimensions that drive visitors who complete a goal. For businesses that sell products through an ecommerce shopping system, Ecommerce reports will give you insights into your shoppers’ journey from entry to conversion. You must specifically set up ecommerce tracking to use these reports. The Ecommerce Overview report summarizes your ecommerce conversion rate, transactions, revenue, average order value, unique purchases and the quantity of product units sold. Beneath the main graph, you can see data about your top revenue sources—products, product SKUs, product categories and traffic sources. You can also click through to the following detailed reports. Product Performance—The quantity, unique purchases, product revenue, average price and average quantity sold per transaction for products, product SKUs and product categories. Sales Performance—The total revenue, conversion rate and average order value on a daily basis. Transactions—The revenue, tax, shipping and quantity of items per transaction. Time to Purchase—The amount of time from when visitors arrive on your website to when they make a purchase. You also have the option to turn on Enhanced Ecommerce through the use of specific ecommerce tracking codes. Enhanced Ecommerce gives you access to 10 ecommerce reports that cover behavior analysis, coupons and affiliate codes. Google Analytics typically attributes conversions to the last referral that brought the visitor to your website to make the conversion. Multi-channel funnels help youunderstand the full journey of customers who convert on your website. Ultimately, from the Multi-Channel Funnel reports, you will discover that it’s not just one type of marketing that helps your business, but all types together. For example, someone who visits your website from a social network may later decide to buy because they see your name again in a blog post. Someone who visits your website from search may later decide to buy because they see an ad on Facebook. The possible combinations are endless. The Multi-Channel Overview report gives you a summary of each marketing channel that works to drive converting visitors to your website. 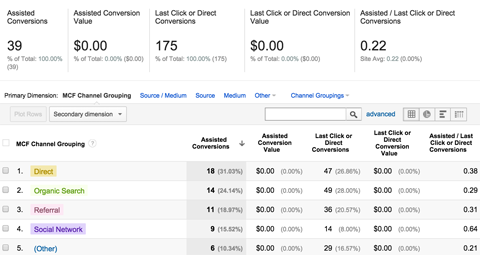 Google Analytics Conversions Multi-Channel Overview. Assisted Conversions are the number of conversions for which this channel appeared on the conversion path, but was not the final conversion interaction. The Assisted Conversions report shows the top channels that contributed to conversions. See which online channels send converting traffic. To see specific referral sources that act as assisted conversion sources, you can use the Primary Dimension links. 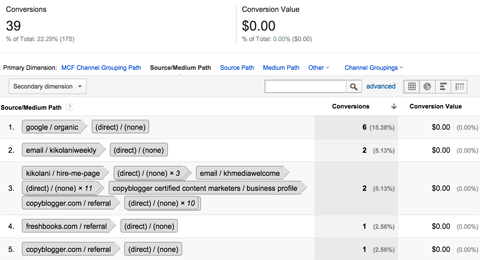 The Top Conversion Paths report shows the source paths followed by visitors who convert. For example, the first row shows the most popular conversion path, where visitors discover the website through organic search and then visit the website again directly (not from search or a website link). 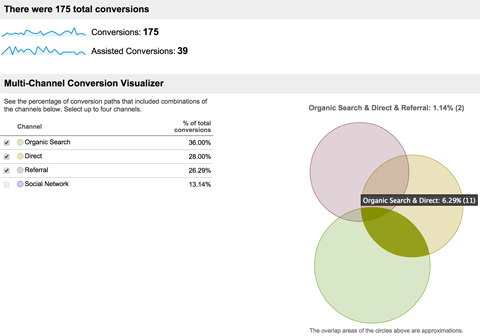 See the path converting visitors take. You can dig deeper into the conversion path by selecting Source/Medium Path as the Primary Dimension. In this view, instead of seeing only that you’re getting traffic from a referral source (another website), you can see the exact website that is part of the conversion path. The Time Lag report shows the amount of time in days from when visitors first visit your website until they make a conversion. Find the average converting times. 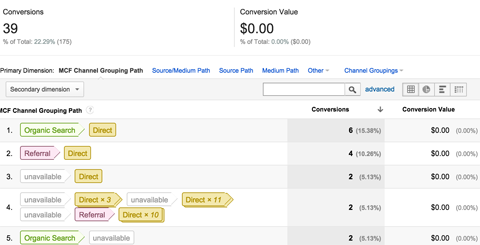 The Path Length report shows the number of interactions a visitor makes on your website before converting. See how many interactions a visitor takes before converting. The final section, Model Attribution, contains one report that helps you understand the difference in conversions attributed to the last interaction versus other attribution models, such as the first interaction. Google Analytics offers the following example. Someone finds your site by clicking one of your AdWords ads. She returns one week later by clicking over from a social network. That same day, she comes back a third time via one of your email campaigns, and a few hours later, she returns directly and makes a purchase. 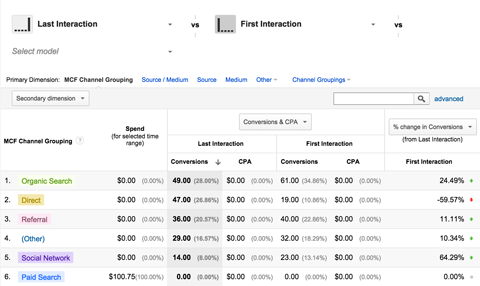 Google Analytics Conversions attribution comparison. In the case above, the Last Interaction attribution is 100% credited to the direct return (the Direct Channel). The First Interaction attribution is 100% credited to the AdWords ad (the Paid Search Channel). The Linear attribution is credited evenly among Paid Search, Social Media, Email and Direct. Google Analytics Conversions reports offer a number of ways to view and analyze the way people navigate your website on their way to converting. Use the reports in this article to drill down on pathways with a high conversion rate to identify and adjust pathways that aren’t performing well.